If you are not redirected, click this button to see our new site. Don't forget to change your bookmark! Weather and climate are different. Weather is a short term description of the air in an area measured by temperature, precipitation, humidity, wind, and other factors. Climate is usually defined as the weather conditions in an area over a long period of time. Climate is determined by 1 or more of the 5 causes of climate. There are 12 different types of climate found on Earth. Each of the 12 climate types are grouped into 5 categories, except 1 (Highland). 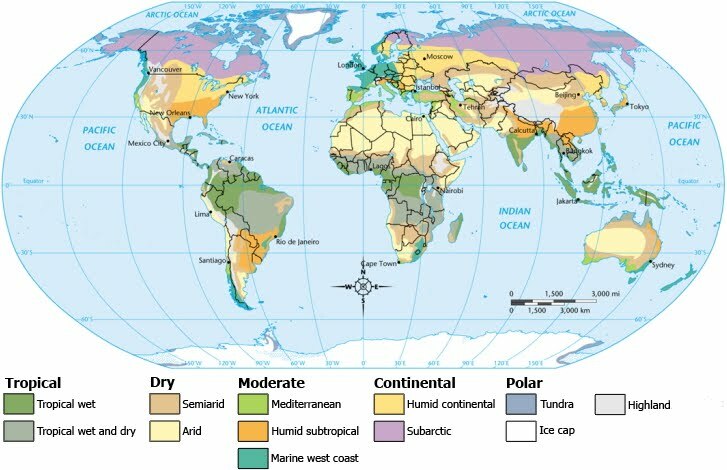 Climates in the same category share characteristics and usually are found in the same area. Climates change over time, usually the change is very slow. The Earth has experienced many different climates over its 4.54 billion years. There are many different factors that cause climates to shift and change.